In the fall of 2007, I was contacted by Jo Ann Hatch from Byrdstown and asked if I might find out what family once lived at the foot of the hill below their home on Dale Hollow Lake. Jo Ann and her husband, Raymond, live in a subdivision called Five Fingers Estates located directly across from Duncan Bottom on Dale Hollow lake. The stone foundation of an old home place still remains and can be seen when the lake is low. Jo Ann was curious about the family who once lived there long before Dale Hollow lake was formed. The point where the old home once stood is a place she and her husband enjoy walking down to, and when the grandchildren come to visit, they swim there. Jo Ann told me a beautiful little yellow rose bush once grew there until someone dug it up and carried it away. She often thought about who the person was that may have placed the rose bush there many years ago and tenderly cared for it. I did some investigating and learned that the property once belonged to James Harden Jolley and wife Alba Holt Jolley. (Some families spell the name J-o-l-l-y, others spell it J-o-l-l-e-y.) .The log home was near what is known as Jolly Creek and the Obey River long before Dale Hollow lake came into being. James Hardin Jolley was born in 1881 and died in 1942. Everyone called him by his middle name and the location of their home was known as the Hardin Jolley place. The log house, with 12 foot ceilings, had three bedrooms, a front room, and a kitchen. It was in that home that thirteen (13) children were born. Those children, in the order of their births, are: Arco; Floyd Elza; Viva (died at birth); Veo; Cohen Reeves; William Lloyd; Thurston (died at birth); Walter Morton; Ernest Elmo; James Phillip (everyone called him J.P.); Dosha Mae; Kenneth Ray; and Aaron. Harden Jolley and wife Alba (Holt) Jolley and Melvina (Little) Jolley (known as "Pine") pose for a photograph. Melvina is the mother of Harden Jolley. foundation of the store can still be seen when the lake is down. 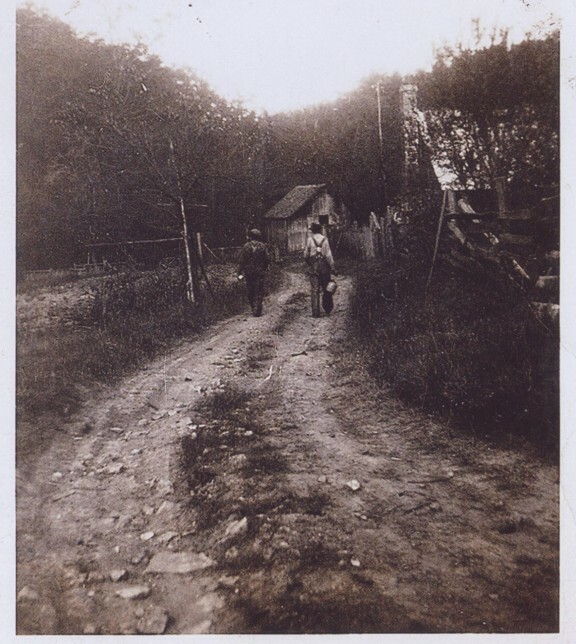 The Jolley farm originally consisted of about 200 acres, most of it in woods. When Dale Hollow Dam was constructed and the family had to leave that area, they moved to the place where the son, Kenneth Jolley, still resides (at the date of this writing) on Love Lady Road in Byrdstown, Tennessee. Kenneth was kind enough to provide me with information about their family and their old homeplace. "I was born at Grandpa Amos Jolly's home south of Bloomington, Tennessee. My parents, Milton H. Sells and Lena Myrtle Jolly Sells, lived on Barnes ridge across the Obey River. My father worked the farm for a living. Mom was staying at my Jolly grandparents' home when I was born. Dad was at the Barnes Ridge place working the day of my birth. Somehow mom got word to dad that the new baby was on the way. That particular day, the river was flooded, so dad got an old boat and rowed across the overflowing and dangerous river to be with mom andme. Luckily, he was able to make it safely across in spite of all the debris floating down the flooded river. "Before we moved to Jolly creek, my dad worked up north in Ohio during the winter months to help provide for our family. Mom, Fonza, and I stayed with Grandpa and Grandma Jolly during the times he was away in the winter months. I still have cards he sent me and my brother while he was gone. "Our home was a very old type farm house. The only heat source was a fireplace in the front room. The kitchen was a side room off the front room with a wood stove for cooking. Mom always made good warm biscuits for breakfast every morning and cornbread for lunch and supper. She cooked lots of beans in a pot hung on a hook in the big fireplace. There was a large hall separating the front room from the back parlor. Beds were in both rooms. Irons used to do the family ironing with were heated on the cook stove as well as near the fireplace. There was a back porch extending from the kitchen. It had an opening to go through the wide hall to the front porch that went all across the front of the house. Large kettles were used outside to heat water for laundry which was done by hand on a washboard. Clothes were hung outside to dry where they would freeze on the line in the winter months. "I went to first grade at the young age of only 5 years old. I can remember walking with my Uncle Wayne Jolly to Bloomington. I don't remember the year we moved to what was called the hollow (Jolly Creek). My brother, Fonza Sells, was born June 13, 1924. I recall he and I going to Riverside school his first year. Our teachers at Riverside were so down to earth. I especially remember Norman Hill. He came and spent a night at our home. He was also editor of the Pickett County News in later years. Doris Harrison was another teacher at Riverside and my uncle Amon Jolly taught there one year. I finished eighth grade at Riverside school in 1931 and started high school at Pickett County High School in Byrdstown. I had to walk around three miles to Bloomington to catch the bus there. Walking that distance on stormy, rainy and sometimes very cold days were not any fun. My brother, Fonza, was not very interested in school. I would often carry him on my back up the hill and down the next one to the valley where the school was located on the bank of the Obey River. The place Riverside school stood in now covered by the waters of Dale Hollow lake. During this time period, the government was planning and working on the lake project. We knew our place would be taken so we moved in with Grandpa Jolly. My Grandma Jolly had passed away and it would help us as well as my grandpa for us to live with him. So the last year I was in high school, the school bus came down as far as the point at Harrison Hill overlooking the Obey River. It turned around there so I didn't have to walk to catch the bus. The large hill on one side of the river which would have been southeast of our hollow had large bluff rocks extending out. We kids would go and play under those rocks and look down at the road along the river which went past our school. At school, the river bottom had nice birch trees growing there and all the kids would go down in the bottom at recess and climb the trees to make them sway back and forth for a very fun ride. These trees were very limber and tough. When the river flooded, it would come very close to our school. I don't remember it getting in the school house, but there may have been times that it did. Milton Sells and a neighbor, Alex Holt, walk toward the old homeplace where the Sells family lived near Jolly Creek in Pickett County. 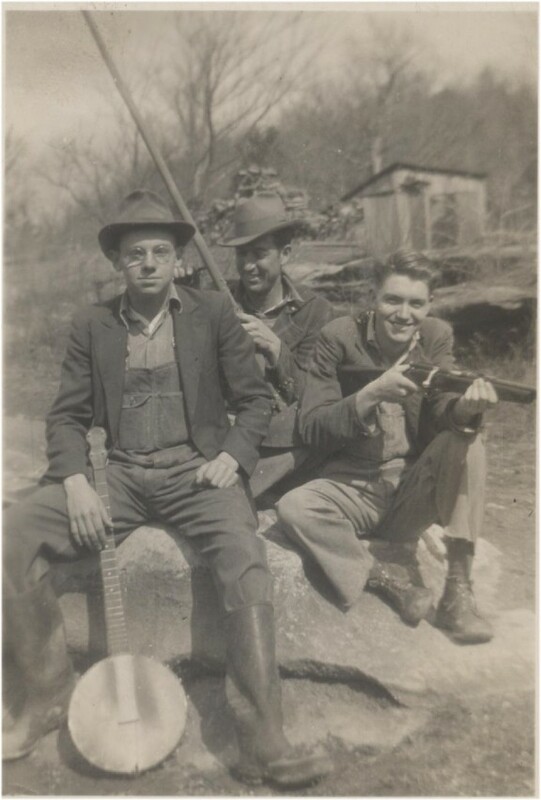 Fonza Sells, holding a banjo, Walter Jolly, center, and Kenneth Jolly, holding a gun, are shown in this photograph taken near Jolly Creek. "I have early memories of helping my dad and mom on the farm. We raised our own chickens, calves, and hogs. Dad had a team of mules he used to plow and plant corn. We cleared ground and made extra farm grounds for tobacco and corn. I remember sitting on a blanket in the field while mom and dad worked in the corn field. One day a snake crawled up on my blanket, but I screamed and it crawled away. "We always had a large garden where we grew lots of potatoes, beans, peas, cabbage, and tomatoes. We also planted several fruit trees since the old orchard on the place was getting too old. We always had very nice peaches and apples. All this happened during the depression. Seems we never had much cash but we had plenty to eat. "Fonza and I would take the mules to get water when dad came in for lunch. I can remember trying to get a ride back to the barn by putting my bear toes over the knee of the mule and pulling myself by its mane. "Our house sat between two steams that connected just to the west of the barn lot and ran into Jolly Creek which emptied into the Obey River near where everyone crossed with wagons and teams into the Lilly Dale community. There was another crossing East that went up the hill near the Butler Jolly place. We went up that hill lots of weekends to visit dad's family in Overton County. Fonza and I and other children around would try and catch fish that would come up the creeks from the river. "We had lots of snakes around. Our dog got bit once on the head by a copperhead, but he survived. He could kill most with no trouble, but this one was back in a hole in the ground and he wasn't able to get where he could reach the snake easily, but he did manage to kill it even though he was bitten first. One day, Fonza and I were on our way to Grandpa Jolly's to get the mail and a blue racer chased us. We lost it and went on for the mail, but on our way home, there it was again. I was so mad because we ran before and when we looked back to see if it was still chasing us, it was no where to be seen. So this time, we didn't run when we saw it again, and we were able to kill it. "Up one of the hollows west of the barn, we had a type of tree called a pawpaw growing there. One day I climbed up the tree to get to the fruit, something similar to a banana. The small limb I was standing on broke and to try to keep from falling, I wrapped my arms around the tree. I was some 10 or 12 feet from the ground and as I slid down the tree, my arms got an awful burn on them. My mom made a soda paste to put on my arms, and even today, at 86 years old, I can still see signs of the sear marks sliding down that tree made on my arms. It was an awful burn. "Fonza and I were playing in the barn one day. He was sitting on top of one of the barn doors pretending to ride a mule while I pulled the rope he has holding on to. He fell off and broke his arm. Today, I can still see that crooked arm and remember running to house screaming, "It's ruined!" "I can remember our neighbors, the Harden Jolly family. Dad, Fonza and all of the sons of Harden Jolly would often go squirrel hunting on wet, foggy mornings. At night, we would see hunters with lanterns walking the hills around our house with hound dogs hunting possums which were skinned and their hides sold. "When I think back to the days when I was growing up on Jolly Creek, I especially remember the peacefulness and the solitude we enjoyed there. The children in the neighborhood were free to roam the woods and hillsides without any of the worries parents raising small children have today. It was a good life." Ola has many relatives in both the Byrdstown area and the Taylor's Crossroads community in Overton County. 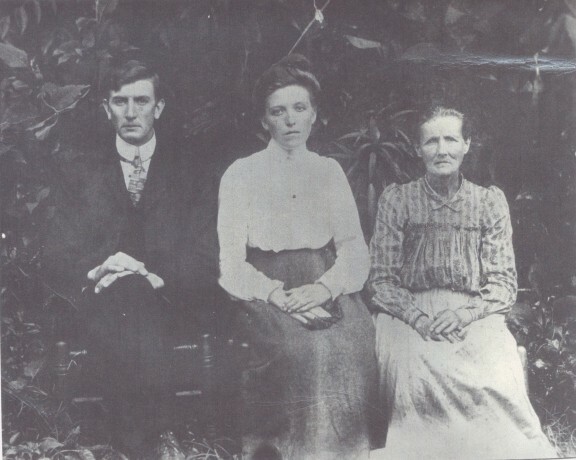 She and her husband, John, reside in Newberry, Florida, and try as often as possible to attend the Jolly Family Reunion held at Obey River Park near Byrdstown each summer.